Do you pay attention to your self-talk? You know, the never ending conversation you are having with yourself? Sometimes we forget that we are actually having a conversation because we are so used to it and think it’s just a normal part of thinking. And it is, for the most part. But there is something else going on. Since we think in terms of language we are actually saying everything we are thinking, not out loud (although some of us do) but in our mind. And for the most part what we are saying is a rerun, an endless running commentary on the past, present and future. See How's Your Internal Dialogue? A major side effect of your running commentary is that you reinforce a lot of the limiting beliefs you may already have. You’re bound to start believing something if you’ve said it to yourself thousands of times….. But the most serious effect all this talking creates is the chaos created from the constant barrage of questions. Questions cause confusion. You may not even be aware that you are asking questions, but if you pay attention you will see that you are constantly seeking answers, trying to see what is next. There are huge question marks floating around inside all those conversations. Trying to discern the answer comes from your ego personality trying to control outcomes. It does not like uncertainty and it especially dislikes contradiction. How do you stop the mind churn and reduce the confusion? A first step is to realize that most of the time you already know the answer. If you don’t have an answer you probably aren’t ready and the answer hasn’t arrived yet. So accept that. You’ll know when you know and until then you can tell your mind that it doesn’t matter. Remember 80% of the things you are worried about don’t happen and the 20% that do are never as bad as you thought they would be. Don't allow your mind to continue on with that particular conversation. I use the word "cancel" sometimes to throw a monkey wrench into it. To stop it. 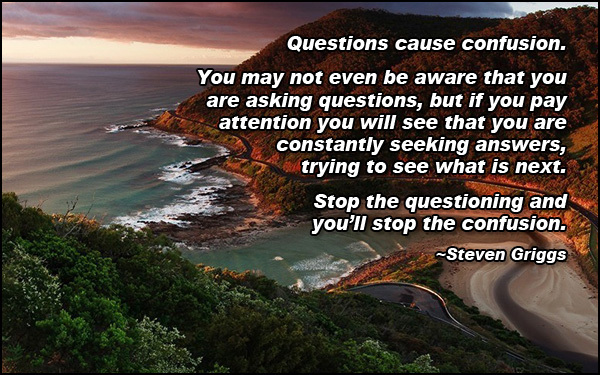 Stop the questioning and you’ll stop the confusion.